Thanks to Apple and other manufacturers of phones and portable audio players, earbuds have been the most common type of stock headphone for more than a decade and remain extremely popular to this day. Though great strides have been made in sound quality and ergonomics, the most obvious example being the new Apple EarPods, there is still room for improvement in both sound and fit for many users. Earphones, often referred to as In-Ear Monitors, or IEMs, offer the potential for great comfort and sound quality for a variety of ears, but rely heavily on a good seal with the ear canal. This earphone fit guide is designed to help you achieve the best seal, comfort, sound quality, and secure fit from your IEMs. If you are new to in-ear earphones/IEMs, your first experience can be a negative one. Many people simply don’t like to stick anything in their ears, but earphones require an airtight seal between ear tip and ear canal. 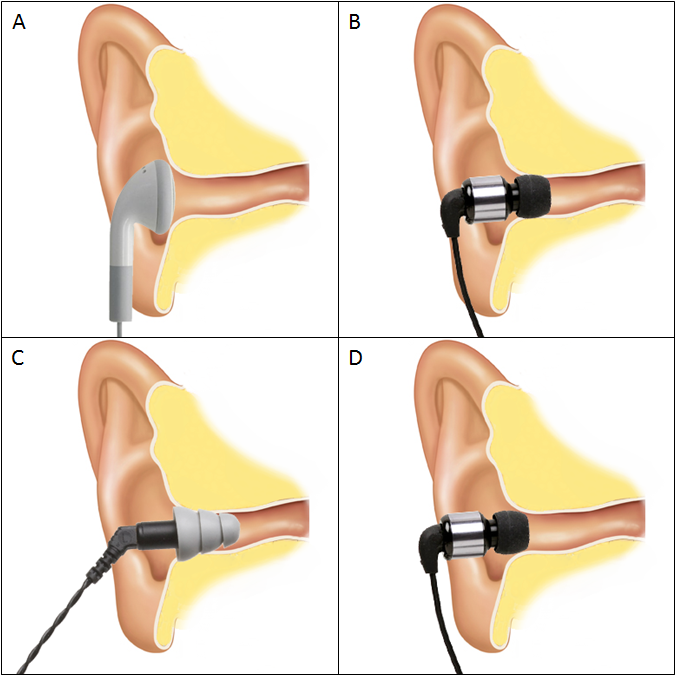 If you take a look at image A in figure 1 you will see that they sit in the outer part of the ear while image B shows the ear tip inside the ear canal. 1) Is your earphone designed to have the cable go down, go over-the-ear, or either? I have seen people wear over-the-ear earphones with the cable down resulting in a horrible experience. The packaging and/or product page should show the proper wear style. Also, make sure to follow the left/right markings. 2) Use the proper sized ear tips. Earphones usually come with multiple sizes of ear tips. Trying all the sizes that came with the earphone will help you achieve the best combination of comfort, security, and good sound quality. Even if you have preconceived thoughts about the size of your ear/ear canal, a particular ear tip may fit better than others. For example, if you have medium sized ear canals, a small ear tip will allow the earphone to fit deeper, which may give a better result. Or, a larger ear tip may sit further out for better comfort, and with the size of your ear or an over-the-ear wear style, still stay put. 3) Adjust the angle the nozzle enters your ear canal. Ear canals are angles forward and up, so the nozzle should also be aimed in that direction. Once inserted, or while inserting an earphone, try different angles with different ear tips to see what feels the best and provides the best seal and comfort. 4) Adjust the depth of insertion. Typically, the deeper the insertion, the better the seal and isolation, but sound quality varies as some earphones sound better with a shallow insertion while others sound better with a deep insertion. Experiment with different insertion depths until you find what works best for you with the particular earphone. 5) Reduce cable noise. Cable noise caused by the cable rubbing against clothing or other objects is called microphonics. If your earphone has microphotonics, there are some ways to reduce or eliminate it. a) If your earphone uses a cable down configuration, try to wear the cable over-the-ear. b) Tighten a cable cinch, which is a slider that holds the two parts of the cable together past the Y-split, which is where the cable separates for each channel. c) Wear the cable under your clothing. d) Wear the cable behind your back. This may work for when you are up and about, but typically not when you are doing something like sitting at a desk. While you may find a great configuration for one earphone, another could require a completely different setup due to a different shape, design, ear tip style, etc. It is best to go through this process for different earphones to achieve the highest levels of performance. A) Conventional Earbuds. 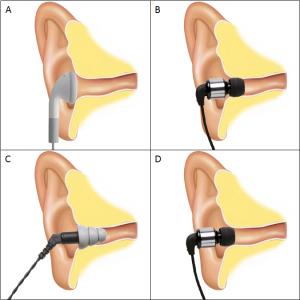 Earbuds sit in the outer ear and create a loose seal at best, as shown in Figure 1 A. Typically, they provide low isolation from outside noise and need to be turned up louder in noisy environments. 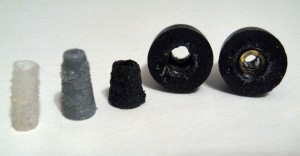 In addition to low isolation, the lack of a seal typically results in lower quantity of bass, especially deep bass, compared to other types of headphones. The one-size-fits-all nature of ear buds will result in many users having trouble achieving the best comfort, sound quality, and/or secure fit with earbuds. B) In-Ear Monitors. In-ear monitors (IEMs), characterized by having ear tips that form a seal with the ear canal, as shown in Figure 1 B, are also commonly called in-ear headphones or earphones. IEM performance is heavily dependent upon ear tips, which we’ve seen called ear nubs, ear bits, inserts, fittings, etc., to determine sound quality, comfort, isolation, and fit security. C) Types of IEMs. While “IEM” was a term originally specific for earphones designed to insert deep into the ear as shown in Figure 1 C, it has evolved to broadly correspond to pretty much all in-ear headphones. A sub-category, “canalphones”, implies earphones that require a shallower seal (Figure B). Canalphones typically block out less external noise than IEMs, but with the number of different offerings on the market the lines between canalphones and IEMs have become very blurred. We typically refer to all in-ear headphones as “earphones” or “IEMs”. D) Driver Type. IEMs typically use one of two driver (speaker) types: dynamic drivers and balanced armature drivers. Dynamic driver IEMs are typically much more tolerant of fit issues as the larger driver moves more air and works better in a semi-sealed environment. Balanced armature drivers on the other hand are precision devices that need a good seal to recreate bass to their full potential, which is typically at a lower level than dynamic drivers to start. No seal = no bass, and a partial seal, such as that shown in Figure 1 D, equal light bass with a dynamic driver IEM but no bass with most balanced armatures. There is a good number of people that don’t know how to get the best fit and seal, as can be seen in some over-the-ear and balanced armature models of earphones on Amazon. When someone bucks the trend and says there is no bass from a known bass heavy IEM, it most likely isn’t the product, but the user (although products can be defective). If you are experiencing any of the above issues, try pushing the IEMs deeper into your ear canal and/or try different ear tips. Using an incorrectly sized eartip can have other negative effects on the seal, such as an eartip that is too small may not reach the sides of the ear canal for an airtight fit while one that is too large can make getting a deep enough seal impossible or – in some cases – can even collapse inside the ear canal, again preventing a good seal and reducing comfort. Other factors that can affect fit include insertion angle, earphone design, and earphone wear style. The ear canal is naturally angled slightly towards the front and top of the head, and angling the earphone appropriately during insertion can help. In addition, wearing IEMs “over-the-ear” by wrapping the cable around your ear before inserting the earphones, can often help avoid parts of the ear anatomy that can otherwise prevent a good seal. I can usually get a much deeper and therefore better seal by wearing IEMs that are designed for cable-down use with the cable over the ear. Most earphones will have a very noticeable reduction in outside noise when a proper seal is achieved. There are some exceptions, such as the relatively rare open-backed IEM, or some that are just poorly designed and don’t offer a lot of isolation, which would be indicated in the isolation rating for the review. It is also important to note that most IEMs won’t completely block out external noise, and your awareness level, anatomy, ear tips, IEM design, and music volume will all contribute to how much external noise you can hear. Ear tips are the interface between the earphone and your ear canal. Everybody’s ears are unique, so certain ear tips may work better for you than others. Typically, a minimum of three sizes of ear tips are included with an earphone, but there can be multiple sizes and types, or in an extreme case, one size/style (EarSonics). 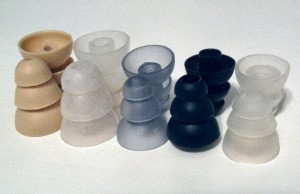 Single flange – Single flange ear tips are the most common ear tips, and as the name implies, they use a single piece of silicone to create a seal. There are significant differences in single flange ear tips due to material density, thickness, and shape. The denser the material, the more isolation they will provide and the higher the level of bass. The thicker they are, the less pliable they will be, which may be good or bad. If they are too soft, they can collapse in the ear, which is affected also by shape, and if they are too hard, they can become uncomfortable. A very popular shape that works well with most ears is the Sony hybrid ear tips, and this pack includes 4 sizes. Westone recently released new STAR (+ TRUEFIT FOAM) ear tips that work well for many. Bi-flange – Bi-flange ear tips have a large and small flange on the same stalk and while there are many different sizes and shapes, there are far fewer options as they are less common. The advantage a bi-flange ear tip has over a single flange is they can have two independent areas that can seal with the ear canal, creating a better overall seal. This will result in more bass and isolation if you can get them to fit. The disadvantage is the limited sizes available, and if they don’t fit your ear, they will be useless. Using a bi-flange ear tip when only the smaller flange creates a seal isn’t a good idea as it is best to use a single flange, which offers many more sizes and shapes. If you have very large and deep ear canals, the Hi-Fi Man bi-flange ear tips may work well. Triple flange – Triple flange ear tips take bi-flange ear tips to another level. When they fit, they provide a better seal and higher levels of isolation. They work well for getting the most out of many balanced armature earphones as the seal is critical for bass performance, if your ear canals are deep enough. Triple flange ear tips typically work very well with earphones that have angles nozzles and those that use an over-the-ear fit. Most triple flange ear tips are soft, although the Westone style aren’t, and are susceptible to bending in the ear canal and muffling the sound. Triple flange ear tips are readily available, and this Amazon seller has a good rating with a great deal. Foam – Foam ear tips are soft, compliant ear tips that conform to your inner ear. They come in a wide range of density and finish, and Comply has made foam ear tips extremely popular with their ultra-soft foam. Other foam is denser, but will conform to your ear canal over time. Inserting foam ear tips is different than inserting a typical ear tip, as the foam should be compressed before the ear tip is inserted, and the earphone needs to be held in place until the foam expands back into shape. Foam offers an exceptional seal and high levels of isolation. The negative with foam, which is dependent upon the density, is that they don’t last as long as silicone ear tips, most can’t be cleaned, can be expensive, and some absorb some of the treble energy, changing the sound. Monster makes foam ear tips with a silicone insert at the tip to alleviate the treble absorption issue, but the foam they used caused my ears to itch. Other styles – There are plenty of non-standard ear tips available, and one main player in that area is Sensorcom, which manufactures various sizes and shapes. If you have a large IEM collection and want to play around with different ear tips, there are other options out there that can make a difference. Some manufacturers include unique styles of ear tips, such as Sennheiser in their IE80. Custom fit ear tips – Custom fit ear tips are available for various earphones, and can be made for any particular earphone upon request. While I do think there is an improvement with custom fit ear tips, the relatively high cost and low levels of improvement prevent me from recommending this style of ear tip. 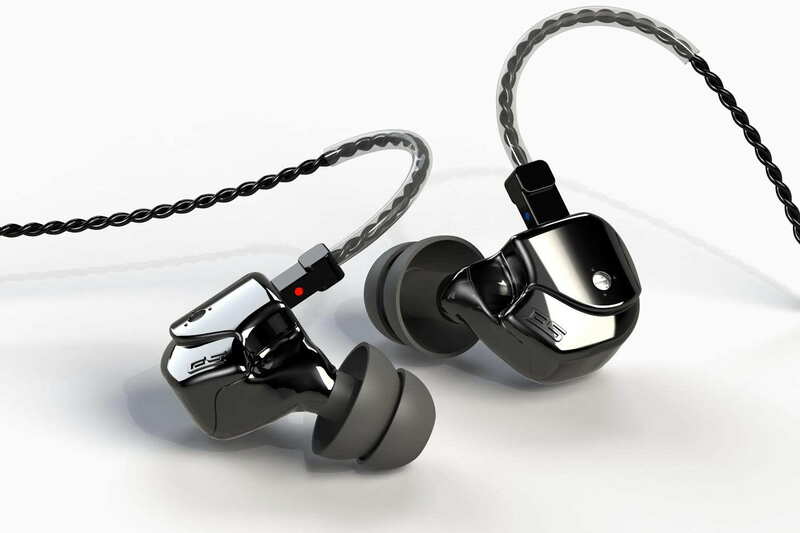 It may work for some, especially those that want a custom fit and to have the ability to replace the earphone when necessary, or swap between several IEMs with the same nozzle size. 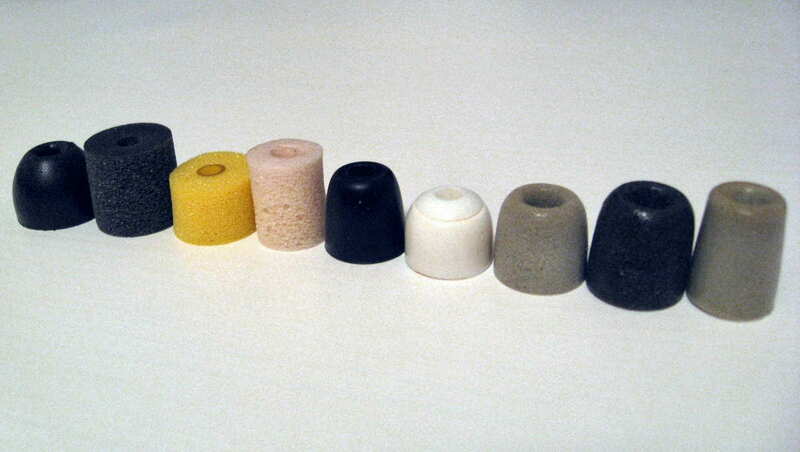 Spacers – Earphone nozzles vary from manufacturer to manufacturer, so not all ear tips will fit all earphones. What happens if you have a smaller sized nozzle but want to use ear tips with a larger diameter stalk? If you just put them on, they will end up stuck in your ears. Using a spacer will alleviate this issue, as it will fit securely on the earphone nozzle and allow the ear tip to fit snugly. The spacers I prefer are from Shure “Olive” foam tips, but you can use any foam insert or a small diameter plastic/rubber tube. If you do use a foam ear tip, use caution when removing the foam, and I recommend finding small tubing instead. Home-made – I like the longevity and sonic qualities of silicone, but also appreciate the better isolation of foam, but didn’t want to keep replacing foam all the time. Removing the stalk from a foam ear tip allowed it to be placed under a flange of a single flange ear tip, providing the best of both worlds. I also experimented with using some tubing in to extend the distance from the IEM to my ear drum, which increase the soundstage size, providing more of a headphone feel with the IE8. Let us know if you have any earphone mods you use. I have found that the most comfortable product is shaped like Urbanears’ Reimers, which is an earbud– in the old school definition of non-invasive product– with a silicone cover that is to the side. I’ve had the worst time trying to shop for these because (a) they use “earbud” do describe everything now, including invasive earphones and (b) there doesn’t seem to be any term that described these side-angled silicone covers. Can you help? Am I missing something? When I look for angled- or side- buds, I usually get a bunch of the buttplug styled ear jammers that happen to be perpendicular to their fixture but aren’t themselves actually angled. HI, I am a designer planning a comfortable long-time wearing earphone (12hours/per day ), can you give any suggestion? I really wanna do a good product for the delivers of our company. Hi Jaimme, nice to know you here. we are the manufacture of earphones. are you interested in talk to me pleasE? Thanks for your great review, that was very useful. I upgraded my iem to get better isolation of noise/wind when I take the plane/ride my bicycle. I picked the 1more quad and only discovered THL once my purchase was done. The review on this website is amazing with only negative being the shallow fit of the earphone. I do love the sound but agree that the isolation is not the best; which was the main thing I was looking to improve with my purchase.. I am still experimenting with the different eartips provided in the case but would appreciate if you have any recommendations of 3rd party eartips that could offer a better isolation. Or do you think that because the earphone is built with a shallow insert different eartips wouldn’t really improve the isolation and maybe I should try different iems? What a great guide! I discovered Klipsch oval tips and they fit my ear canals perfectly, but I’m wondering if there are any other brands that I can use those Klipsch tips with? Thanks for your article, I know this sounds crazy however, the Conventional Earbuds are the best fitting for me. Like the Sony E9LP In-ear. I have trashed so many pair of these by snagging the wire its crazy, but, try to find a wireless set with that style of earbuds is apparently impossible, right? Any idea if there is a way to build up the thickness of silicone iem’s? I have some as custom ones that don’t seal properly. After recently purchasing the Vsonic GR02 BEs, I read this article. It gave me the idea of using some cheap comply foam earplugs to make hybrid ear tips out of the double-flange tips included with the earphones. I was able to get a better seal in the smaller flange as well as take away some of the highs that I found a little overpowering for me. I also tried doing the same for the larger flange, and I got even more sound isolation, but it felt like too much of the highs had gone away. I ended up ripping out the non-comply, open-cell foam found in the included hybrid tips and using them as well. I recently got my first pair of IEMs and was getting mixed results, e.g. massive variations in bass quantity, which I thought might be due to how they were fitting. Thanks to your advice, I’ve managed to get both better comfort and a much more consistent sound. Hi Paul, thanks for reading and great to hear about the improvement! I’m looking to get some fairly good sounding IEMs. I fly often, and am looking into making my own custom fit IEMs that are encased in molded silicone or one of the other available options (like Radians). How do I filter your great reviews for good options. I would like sub $100-ish models that will work well in this use. I’d like a form factor that is small enough that the completed unit will end up fairly close to flush with my ear so that if I have my head reading in a pillow it won’t feel like I I’m cramming the ear bud through my head. Since this approach gives a good seal, the out of the box seal rating doesn’t matter as much to me. Happy to hear any advice you have. I lost one side of my beyerdynamic dx160ie’s tip today and stumbled upon your article. i was wondering if the HIFIMAN RE400 Flanges&Filters will fit my earbuds or not. still deciding between comply foam or the rubber ones. the durability of the foams made me think twice. I don’t have a DTX160 but if it has the same standard nozzles like the DTX101/DTX102 (around 5-6mm in diameter), it should work fine with HiFiMan tips. The only HiFiMan tips that are troublesome are the short bi-flanges, which work best with a certain type of nozzle lip. Other HiFiMan tips, like their large bi-flanges, are very universal. Thank you for a well rounded article. Your expertise in “tip” ooses and I love it. I bought some Westone W40. I received them yesterday. I fiddled around with them all day. I love their sound, clarity, detail, etc. One thing I do not like is their sound stage. It seemed like the directors of all my orchestras have moved all their musicians on the front 2 rows :-). Plus the piano in concertos are often too much to the left, and occupy a large part of the small soundstage. Are there any tip that would lmproved “soundstage” as far as depth is concerned? I read in your article about not putting them to far in the ears. I am told that “burning them in” will improve them. I don’t know if that stand to improve soundstage what do you think? It’s worth trying all of the tips you have that will fit and listening for the improvements you want, but as far as a specific aftermarket tip to improve the soundstage depth of the W40, I don’t know of any. A Meier crossfeed may help with the issue of things sounding a little too far to the sides. To me, it also makes depth a bit more accurate, but not necessarily “farther.” Just a lot easier to discern and more realistic. I’m really looking forward to the section about nozzle size. Also, it’d be great if you could somehow search your reviews by nozzle size—I have tiny ears and NOTHING ever fits and I’m tired of spending money. I might try the Sony MH1C. A friend of mine had Sony stock earbuds with an MP3 player about 5 years ago and they were the first ones that ever fit me, but I couldn’t find them anywhere. If you could recommend any other, seriously small earbuds I’d be grateful. The MH1C is smaller than average but not the smallest. I recommend the Fidue A31s for this as it’s a very tiny earphone and fairly inexpensive. Not as good-sounding as the MH1C, but it fits wonderfully in smaller ears. Hi do you know of any wireless sets that fit small ears? I would love to have something to work with the Bluetooth on my Fitbit for running. The only pair I’m quite comfortable in was a set with a tip that fit just the end into your ear canal. I think they were marketed at women and came in purple. I have a photo but can’t find them online. They’re kinda like this shape https://goo.gl/images/KkxVk2. Regarding cable down or over the ear, is there any way to know how the IEM’s were designed to be worn? I have a dozen pairs and I don’t use them all every day. Is there some trick you can use to determine the correct orientation by just looking at a pair? Could I hand you a pair of IEM’s you don’t recognize and have you tell me the orientation you’re supposed to use? Maybe it’s obvious (or maybe not according to what you wrote above), but I would have to look up each pair to know. I probably could just going off of experience, but otherwise the most surefire way is a combination of the Left/Right markers on the earphones and whatever people-wearing-product images the manufacturer has on the website, packaging, etc. Nice article. I just wondered; do all in-ear headphones require the tragus to hold them in place? As mine sticks out and won’t hold in any that I’ve tried. There are several IEMs that stay in place by virtue of ear canal seal alone – for example the skinny “straight” designs like the Etymotic Research HF5: https://theheadphonelist.com/headphone_review/etymotic-research-hf5-hf2-hf3/ . In this case the shape or size of the tragus shouldn’t matter as long as it’s not in the way. Good read to understand the way things works for our ears with Technology. But just wondering, any idea if eartips are the same for all in-ear earphones/IEMs? No, eartips from two different earphones can be very different. Westone eartips have the smallest internal diameter. Typical eartips from Shure and Etymotic Research will fit Westone earphones as well. Interesting article…. I need an advice, My ear canals are narrow, but would like to get earphones/buds thatdkn’t fall off. I haven’t found a pair yet that will fit into my ears. The smallest one I found so far, the diameter of the inner sound projecting part diameter is 6mm. They’re out there, just not as common – some have nozzle diameter as thin as 2.5mm. A personal favorite for smaller ears that I’ve tried recently is the Fidue A31s: https://theheadphonelist.com/headphone_review/fidue-a31s-in-ear-earphone-review/ . Amazingly small earphones all around, and they come with smaller eartips than usual, too. I really appreciate your help. I will definitely try them. I finally have received the headphones you suggested…..they fit perfectly, thank you. I find that the quality of the sound not so good…. Well, I was not expecting anything more for that price. I will be using them for podcasts and stuff, but for music, would you be able to recommend me of another small earbud headphones that are of better sound quality. Yeah, now that we’ve established that there are IEMs that fit well you have some options. The best one if you’re willing to spend the money is the Klipsch X10 or X11: http://amzn.to/1U7Gbp6 . Very tiny earphones with great fit, and the Klipsch eartips are excellent, too. Not the absolute best value for sound quality alone but the combination of sound AND fit can’t really be beat. If you don’t mind an over-the-ear fit you can also try the Westone W1/W10: http://amzn.to/1WTIj2x. These are tuned for a slightly more flat/reference sound than the enhanced-bass Klipsch. They also aren’t amazing value for sound quality alone and can probably be called a bit boring in terms of sound tuning, but they’re a nice single balanced armature earphone with a very comfy form factor. In the absence of any other specific requirements (for sound tuning or otherwise) these two are what I’d be looking at. The links to the suggested tips don’t seem to be working. Any chance of updating them? Sorry Dan, a site update wiped out many of the links on the site. They should be restored soon, unfortunately it may take several days. Thanks for reading. Let us know if you have any questions. My one ear canal is slightly less deep and narrower. What should i do? It is not uncommon for those with asymmetric ear canals to have to use a different-sized eartip in each ear. Memory foam tips (for example those from Comply) are also a good solution as they typically accommodate a wider range of ears. If all else fails, there is always the one-time spend on custom eartips. They are pricy, but custom-made for your ears and pretty much guaranteed to fit. You would have to decide on an earphone first, however, as custom tips are typically designed to fit only a narrow range of products.